Slow action on the markets today, so this is a good time to look at some lesser frequented features of remek.ca. Many of the concepts below will be well-known to many of you, but it never hurts to recap the foundations of successful trading! You also have to record your trades so you can track your account’s (or accounts’) performance. This is what the Remek! Trade Register is for. Note that this is a template, feel free to customize it to your needs (you can save your own copy with Save As…). The main thing is: you must keep accurate records of your every interaction with the market. The expectancy of your system (the system being the result of a) your trading rules b) your disciplined following of your trading rules). The largest expected drawdown (in monetary terms). The minimum recommended account size to trade your system. And finally, a 6 month plan to increase your contract size incrementally while keeping your risk constant (aka the capital accumulation plan). Many traders tend to focus on ‘accuracy’ (i.e. the number of winners) of a given system, forgetting that the expectancy of any system is a result of both the accuracy (i.e. what percent of all trades are winners and losers), and the win/loss ratio (i.e. the size of the average win compared to the size of the average loss). Yes, the number of winners matters. And so does their size. (Think 100 ants vs 10 elephants). Remember, it’s not about how many times you win and how many times you lose. It’s how much you win when you win vs. how much you lose when you lose. 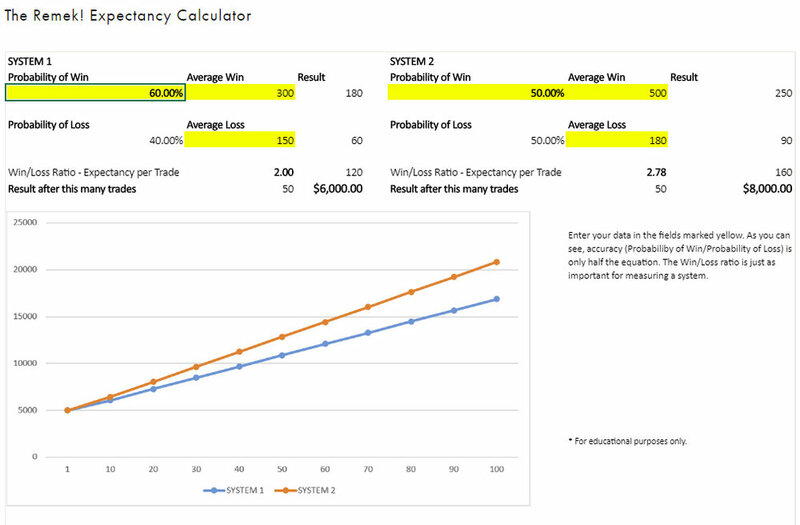 This tool is especially useful when you want to compare two systems, with different accuracy and win/loss ratios. Markets, better get used to it, are, mostly, random and unpredictable. (Visit your local library for details, you’ll find a full shelf on this.) Most of what you see on the chart is meaningless noise. And trading noise, it being random, is meaningless. Thus, our success in trading will depend on our ability to restrict our interactions with the market to those times when the market is not completely random, for the simple reason that that’s where our edge is. Bottom line, in a random environment you, we, simply can’t make money! That’s what random means. Can you trust your lying eyes? or, sometimes, could be the result of an actual market force (momentum, buying or selling pressure) on the market. Now this, this last one, is what you want to trade. But of course, the problem is: there is no way to separate this third category from the first two. And that, in my opinion, is the main reason trading is hard. 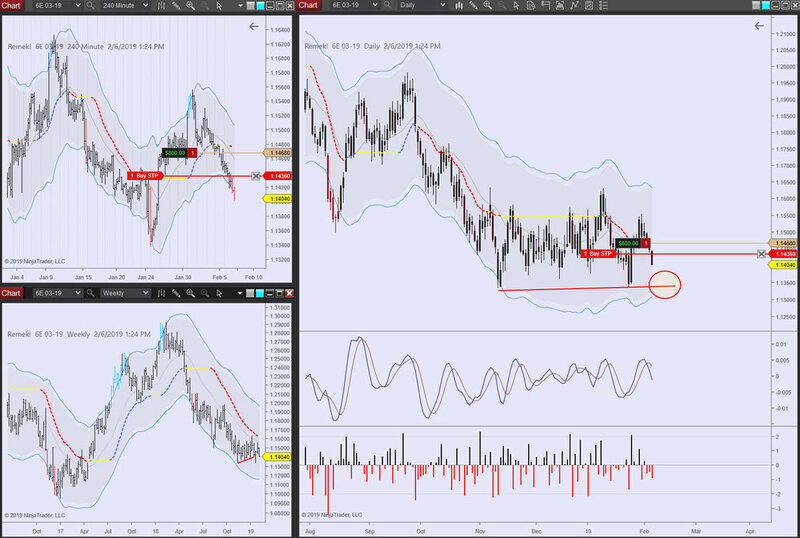 By the way, we, as technically motivated directional traders, we couldn’t care less what causes that buying or selling pressure. Whether it’s a GDP number, the phase of the moon, or yet another tweet, or a news bite, or another talking head on the TV screen, or any combination thereof and a million other things, we don’t really care. We don’t need to. We’re driven by price. Everything we need, to do what we do, is on the chart. What we do care about, though, is to carry out a set of well-defined rules in a largely random environment with utmost discipline, and face the wind, so that our edge has a frickin’ chance to surface. Or better: has no chance not to surface!